Adopt Your Own Starsign Pony!!! Would you like to adopt a pony for your starsign? Well, now you can. It's very simple. All you have to do is cut and paste the following html fragment into your web page, substituting the blue characters for your starsign. When typing in your starsign for the image only write the name of your sign in lower case characters. If your sign happens to be Pisces then the image is a gif file rather than a jpg. All others are jpg. 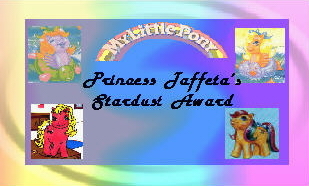 Also, nominate your site for Taffeta's Stardust Award! Just Email me with your site URL !